“Round up your fastest roadie, cross country and downhill friends because this year’s event is a relay,” the event organizers announced in a recent release. Riders will compete in teams of three for each respective leg of the event. The first person to cross the finish line wins the race; all their team members will receive Killington Resort Blackout Season Passes. Road racers will trigger the action in a mass start from the Skyeship at Killington’s Base on Route 4. After climbing to the Snowshed Base Lodge via East Mountain Road, the roadie will tag a cross-country team member who will then ride a series of trails that finish at the K1 Peak Lodge. Tagging a downhill team member, the downhill racer will stop the clock after racing back down to Snowshed. All the riders will congregate for a critical mass ride from Snowshed to the after party at Sushi Yoshi. Although encouraged to round up a team, riders have the option to race stages independently. Prizes will be awarded to the best individual competitors as well. Building on least year’s success, the event will once again highlight the momentum of the cycling community in Vermont. “What better way to celebrate all aspects of the sport than an event where all cyclists can ride together?” asked Nate Freund, co-owner of Sushi Yoshi. All profits from registration and raffle tickets will help fund the Killington Mountain Bike Club, which hopes to use the funds to match a donation from the town of Killington to build new cross-country trail network at Kent Pond. The town of Killington received permits from the Vermont Forest Service in December, 2014 to build 15 miles of trails in the area of Kent Pond and Gifford Woods. In this year’s budget, $20,000 is allocated for trail development funding, the majority of which was intended to be used to be used for matching grants. Between the town and Killington Mountain Bike Club, they will be applying for four grant opportunities totaling about $80,000 between now and January. To build out the first four miles of trails around Kent Pond, a professional trail builder has estimated it would cost $120,000. “I’m cautiously optimistic that we’ll be doing trail work early next summer,” said Webb. 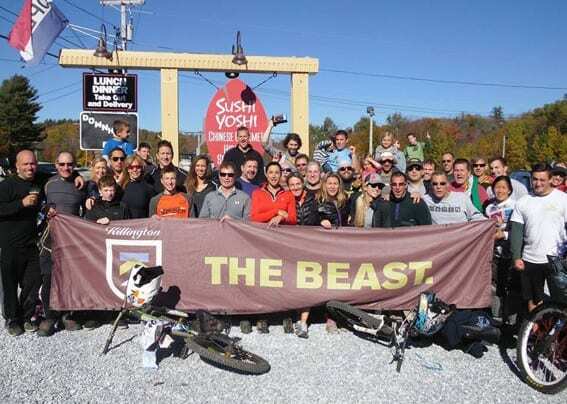 Fundraisers like the Killington (Up &) Down Roll and Rollin’ Fatties, which took place last March, have already been successful in raising thousands of dollars toward the trail development, and they expect this year to grow. Freund expects about 30 teams and 120-150 riders total to participate Sunday. That’s up from last year’s 100-ish participants, he said, adding that he expects the growth to continue in the years to come. This year’s relay-styled event means that “every discipline of biking is now represented and that’s important as we want to attract as much support as possible from the cycling community,” Freund added. In its second year, the Killington (Up &) Down Roll has generated a lot of excitement in the local community. Tony Accurso, owner of Alpine Bike Works in Killington, has been a huge supporter of the event and is thrilled to see it grow in future years. Alpine Bike Works will field a team for Sunday’s event. “We support this event and the [Killington] Mountain Bike Club as much as we possibly can. The community energy around biking has been great,” Accurso added. Frank Marinella is an avid biker (and skier) who splits his time between Killington and Massachusetts. He estimates that he has logged about 50 days on the Killington trails this summer. Marinella will be riding the downhill portion of the relay, following Greg Montello (who used to ride professionally) doing the cross-country leg, and Ian Clarke (an accomplished athlete from Killington Mountain School who podiums in national races) will race the uphill portion. Marinella’s wife, Cara, will also be crossing the finish line after riding the downhill portion for her team of ladies. On Saturday, Oct. 10, there will be a sign-up party at the Lookout Tavern on Killington Road. Course details will be released at the party, so attendance is important, organizers note. Sunday, Oct. 11, group rides leave Snowshed starting at 10 a.m. At 12 p.m., the road competitors will begin the race from Skyeship. The event will commence as a mass start, but the next two stages will be staggered starts. This will allow relay participants right-of-way. The post-race celebration will include a raffle providing a chance to win a new downhill bike, awards, beer and chances to win new cycling schwag. Registration is $30 per competitor and includes entrance to all post-race activities, a riding jersey and a raffle ticket with the opportunity to win a bike and many other great prizes. “Come out Sunday, Oct. 11, to enjoy a fall weekend in the mountains, and help support a growing mountain bike community,” said Freund. The World Cup may come to Killington!